Dunns Swamp, or Ganguddy as it is known to local Wiradjuri Aboriginal people, is a beautiful, serene waterway on the Cudgegong River, created when Kandos Weir was built in the late 1920s to supply water to the cement plant. Dunns Swamp offers great opportunities for camping, picnicking, canoeing and bushwalking. Its spectacular pagoda rock formations offer great views over the Wollemi National Park. A network of walking tracks surrounds the waterway. The picnic area includes a short walking track which is wheelchair accessible and leads to an Aboriginal art site featuring hand stencils which may be over 7000 years old. The area is in the traditional country of the Wiradjuri people. This image belongs to the travel and nature stock photo library. 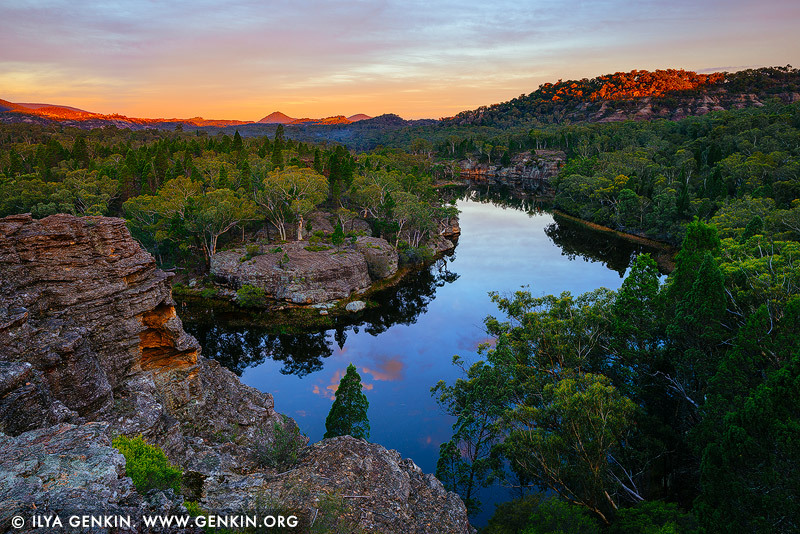 This stock photo of Dunns Swamp at Sunset is available for licensing for commercial and editorial uses including websites, blogs, books, magazines, brochures and advertising. Restrictions may apply for images which contain third party copyrighted material or sensitive subjects. Photos of artwork are for editorial use only. This image id AU-DUNNS-SWAMP-0002 of Dunns Swamp at Sunset, is copyrighted © by Ilya Genkin. This is not a public domain image.